It's new thinking on measuring, mitigating and managing emissions. Innovative research is reshaping what is known about ammonia and related emissions from feedlots. And that new knowledge may help the industry to adjust its management, shape and react to public policy more effectively. "Livestock are significant emission contributors," says Dr. Sean McGinn of Agriculture and Agri-Food Canada, a long-time researcher in the emissions area. 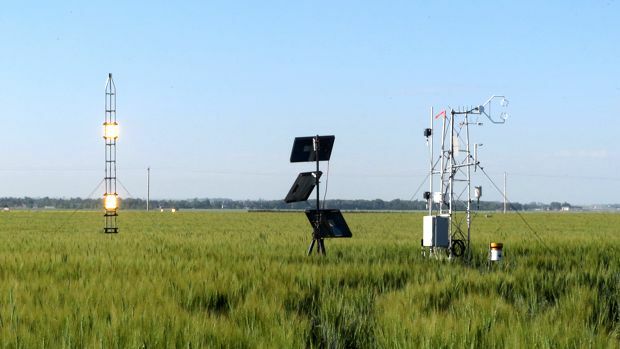 "That's quite clear and generally recognized by the agricultural research community." Some examples. Fifty percent to 60 percent of feed nitrogen is lost as ammonia at the feedlot. Eight to 10 percent of Canada's greenhouse gas emissions are from agriculture and 90 percent of the atmospheric ammonia comes from cattle manure. Ammonia in the atmosphere is an economic loss because the nitrogen fertilizer potential of manure is lowered. And it's a health hazard. Ammonia mixes with acid to form fine aerosols, the white haze seen in confined airsheds. "We know beef feedlots are 'hot spots' of ammonia emissions on the landscape, but we didn't know as much about the dynamics of ammonia emissions from feedlots. For example we didn't have real numbers from actual feedlots on how much is emitted, how much is deposited on nearby soil and how much re-emission occurs when that happens." That's what McGinn and his colleague Dr. Tom Flesch (University of Alberta) set out to understand. 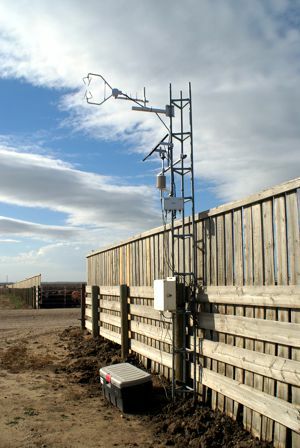 Backed by funding from the Alberta Livestock and Meat Agency (ALMA), a two-year project investigated the fate of nitrogen in feedlots, what amount is deposited on land downwind and how much is carried long distances. 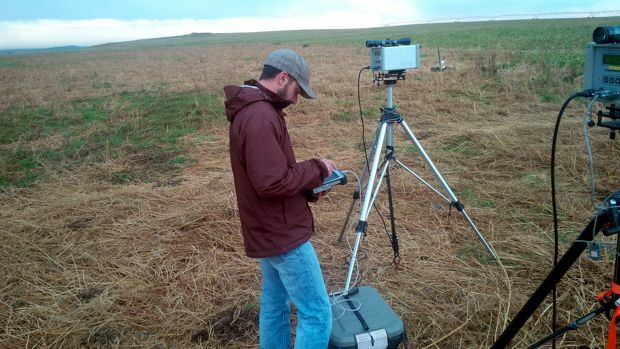 The other part of their research involves measuring methane and nitrous oxide, two prominent greenhouse gasses. Methane is produced by cattle due to the anaerobic digestion of feed in the cow's rumen and both nitrous oxide and methane come from stored manure in the pens. The research produced significant results on several fronts from techniques to measure on a commercial scale, to new information on transfer, deposits and re-emission to nearby lands, to related opportunities for mitigation and management. New measuring techniques. One major positive outcome was the development of new measuring technology adapted from what has been used successfully for measuring flare emissions in the oil and gas industry. 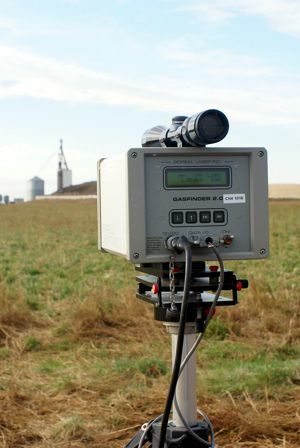 Using open path lasers that move over the feedlot and calculate concentration and wind characteristics, the system is able to measure emissions regardless of wind direction. Measuring in real world situations offers some significant advantages to the more standard research protocols of using animals in individual chambers to measure emissions, says McGinn. This new technique evaluates the feedlot as a whole which means it can consider whole-unit management aspects which impact emissions. 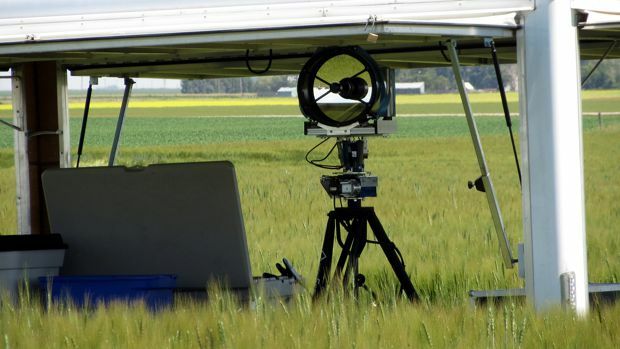 Also, by keeping animals in their natural environment and not interfering with them in any way, the laser approach promises more accurate, commercial scale results. On a bigger picture level, this means actual feedlot emission numbers can be used in greenhouse gas assessments, an improvement from past practices of using estimates from global sources. Early results show surprises. 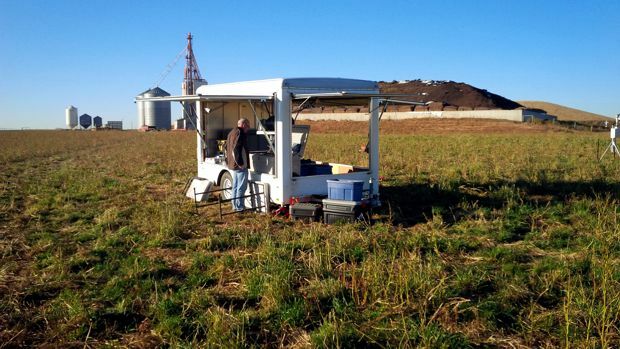 One of the surprises learned from this study was the fact that a significant fraction of ammonia was deposited on the land adjacent to the feedlot and, once deposited, how much was reemitted into the atmosphere. "Our results illustrate the dynamics of reactive ammonia in the vicinity of a beef cattle feedlot," says McGinn. "It confirmed that a large portion of the nitrogen fed as crude protein is volatized from the feedlot's cattle manure. In the local vicinity of a feedlot, both ammonia deposition (14 percent of the emitted ammonia) and reemission occurred. That 14 percent is a large amount considering a typical feedlot emits one to two tonnes of ammonia per day." There was a change in the soil captured ammonia that decreased with distance from the feedlot (50 percent over 200 m). Industry implications. Logically it follows that quantifying the local dry ammonia deposition to surrounding fields is required when applying feedlot-based emissions to a large-scale emissions inventory, says McGinn. Failure to do that could mean badly misrepresenting the real situation. "We need better emissions numbers to anchor effective public policy and fairly represent the feedlot industry in that data pool," says McGinn. "It's important to have research done before policy is set. The U.S. cattle feeding industry already has specific ammonia emission targets in place." Related scientific paper here "Ammonia Emission from a Beef Cattle Feedlot and Its Dry Local Deposition and Re-Emission." Related article at www.meristem.com. "New methane and ammonia mitigation options in the pipeline."